In spite of a continued downward trend in adult rates of smoking nationwide, the rate in Louisiana remains relatively high. Experts say this can be attributed to wealthier people kicking the habit while poorer Americans are still lighting up. Over the last 20 years, the United States has experienced a decline in adult cigarette use1. As of 2015, 15.1 percent of United States adults were current cigarette users2. But at the same time in Louisiana, 21.9 percent of adults were current cigarette users2. The Washington Post suggests that the overall decline in smoking is due to the rich quitting, but leaves the poor unaccounted for in the decline. Here in Louisiana, we know the correlation between cigarette use and low socioeconomic areas to be true. 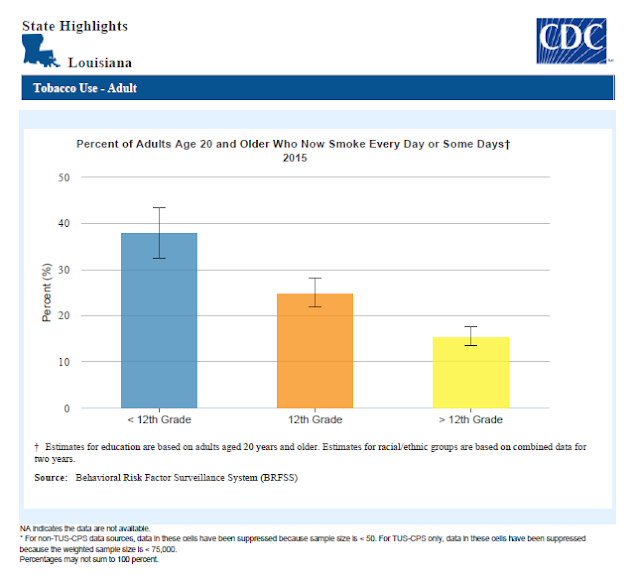 According to the 2015 Behavioral Risk Factor Surveillance System (BRFSS)3, 37.9 percent of current Louisiana adult smokers did not complete high school, almost 25 percent have a high school diploma only, and 15.5 percent have at least some college education. This data shows us that more than twice as many tobacco users have less than a high school education than those with more than a high school education, which speaks to the concern for education level and tobacco use. According to County Health Rankings4, published annually by the Robert Wood Johnson Foundation, many of Louisiana’s most rural parishes reach over the average tobacco use percentage of 21.9 percent with the highest reaching 31 percent in northeast Louisiana. The answer often leans to access. If you think on the most rural areas of our state versus the most populated areas, access to resources is key. Often times there are fewer places to distribute resources related to tobacco-use cessation than in more densely populated areas. According to the Surgeon General’s Report1, cigarette companies are targeting lower socioeconomic (low SES) communities in an effort to retain or increase their customer base in the wake of falling overall prevalence rates. As a result, this leads to a disproportionate representation of tobacco users specifically from these low SES communities. As shown by the map below, some of the highest rates of tobacco use are found in low SES communities (those that are dark blue, and mainly in the Mississippi delta region). What are we doing about this for Louisiana? The Louisiana Department of Health administers the Well-Ahead Louisiana initiative. This initiative is tasked with leading the agency’s efforts to improve health and wellness of our residents. Well-Ahead Louisiana’sWellSpot Designation Program is working across the state to increase the access to healthier options for Louisiana residents. Among these healthy options are resources for providing access to tobacco cessation (quit smoking) services through the Quit With Us LA, tips for how to include tobacco cessation in an employee worksite wellness program and sample tobacco and smoke-free policies for organizations. Each WellSpot designated has a tobacco or smoke-free policy in place for their organization. Additionally, there are grassroots efforts spanning across the state with the help of partners to directly affect each and every one of the parishes in our state. Over the last three years, there have been more than 2,000 WellSpots designated in our state with at least one WellSpot in every parish. This means there are more than 2,000 WellSpots with tobacco or smoke-free policies in place in addition to having access to cessation resources for the employees, patients and patrons touched by the organizations. To find a WellSpot near you, visit: http://wellaheadla.com/WellSpots/Find-WellSpots. Also, individuals can utilize any of the resources for their personal use as well as visit the Well-Ahead Community Resource Guide to find tobacco cessation resources by zip code and/or parish. Is there a local resource that you would like for others to know about? Submit a new resource, or email us at wellahead@la.gov. Help us to move your community Well-Ahead! Well-Ahead Louisiana’s Tobacco Program provides the resources and data needed to combat tobacco prevalence in Louisiana. Through the efforts of Well-Ahead Louisiana, we expect to see continued increases in access to tobacco cessation resources statewide, leading to a decrease in tobacco prevalence over time. 1. U.S. Department of Health and Human Services. The Health Consequences of Smoking — 50 Years of Progress: A Report of the Surgeon General. 2014. URL: http://www.surgeongeneral.gov/library/reports/50-years-of-progress/full-report.pdf. 2. Centers for Disease Control and Prevention. Current Cigarette Smoking Among Adults—United States, 2005–2015. Morbidity and Mortality Weekly Report 2016;65(44):1205–1211 [accessed 2017 June 20]. 3. Centers for Disease Control and Prevention (CDC). Behavioral Risk Factor Surveillance System Survey Data. Atlanta, Georgia: U.S. Department of Health and Human Services, Centers for Disease Control and Prevention, . 4. University of Wisconsin Population Health Institute. County Health Rankings Key Findings 2017. 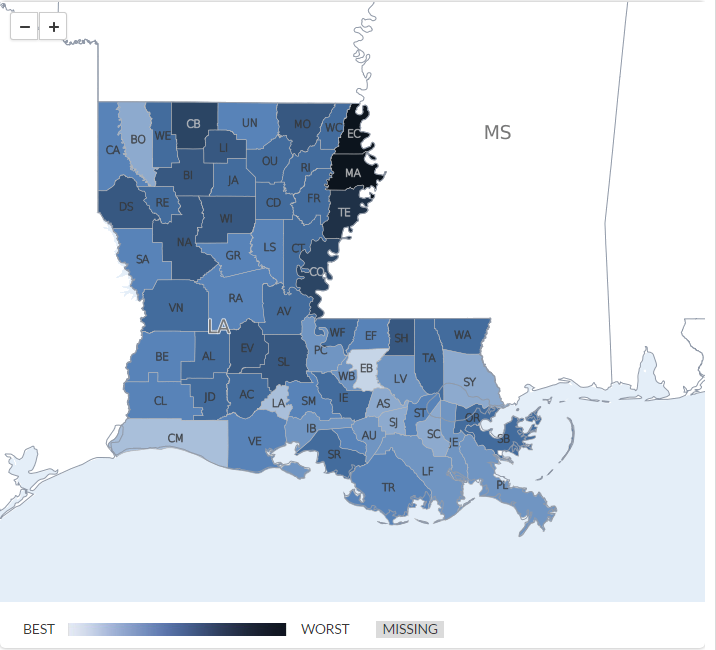 0 Response to "Tobacco use rates in Louisiana remain high while rates go down nationwide"